Florida is prone to brush fires, but most occur in the spring and summer after thru-hiking season. Those fires are triggered by lightning on the leading edge of thunderstorms but are soon put out by the storm itself. 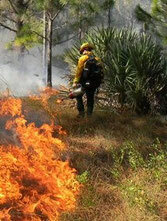 This natural process means Florida ecosystems are both adapted to and dependent upon regular fires. To maintain ecosystem health and preempt dangerous wildfires, public land managers regularly conduct "prescribed" or "controlled" burns. Essentially, two linear fires are set and are supposed to burn toward each other. When the two lines of fire meet, each has exhausted the fuel needed by the other and they extinguish themselves. It doesn't always happen that way, however. According to the Florida Department of Agriculture, "the Florida Forest Service oversees one of the most active prescribed fire programs in the country. In an average year the Florida Forest Service will issue 120,000 authorizations allowing people and agencies to prescribe burn their land. An average of over 2 million acres are treated with prescribed fire each year." Prescribed burns take place primarily during the dry winter months, which is also hiking season. This can cause a trail closure. If a prescribed burn will affect the Trail, land managers are supposed to post trailside notices with dates to warn hikers. Designated blue-blazed alternated routes do not exist to circumvent prescribed fires. It is up to the individual thru-hiker to figure out a way around the closure. One option is to check the FTA's trail closures and notices page to see if a suggested route has been posted. Regardless of what year you hike, at least some parts of the Florida Trail will have been recently burned. Tree trunks will be black. The palmettos brown or gone completely. You may even find yourself walking through a still-smoking landscape. Do not lament its destruction. The ecosystem is improved by these burnings and there is a strange beauty to a burned landscape. You also get to see the process of ecological succession in action.